Fingerprint door lock is one of the latest innovations in the security devices. A fingerprint door lock is a key less door lock which eliminates any chances of duplication. Nowadays, bio metric devices are not only used in large organizations but have also become very famous for household security. This technology is the most practical one as it is cost effective, reliable and non-intrusive. It is the ideal solution to the problems of searching for the door key, door key being lost and so on.A bio metric door lock uses physical traits for identification process as every person has a different fingerprint. As a matter of fact no two fingerprints are identical. The main technology used in capturing fingerprint image is optical, silicon and ultrasound. The setting up of such locks is very easy and it is advisable that it is done by a skilled person. Your fingerprint is scanned and converted into a numerical algorithm and saved in the database. Now when you attempt to unlock the door, your fingerprint is scanned and compared with the data stored in the system.There are two main algorithms to recognize fingerprints, Minutia matching and Pattern matching. When you register with the lock for the first time, the minutia points are located along with the position and direction. In the matching stage the already stored image is compared to the minutia points of the fingerprint. If the fingerprint matches, a green light will be activated for not more than 5 seconds during this time the door will open and you get access. It takes only 0.63s to get a response.If you want to allow access to more people you simply have to add their fingerprint to the system. In case you have some extra prints you simply have to delete the print from the memory. In this way bio metric lock denies or allows access to someone. Most of the bio metric devices such as bio metric locks come with an emergency code lock. This can be used for manual entry in case of any damage. 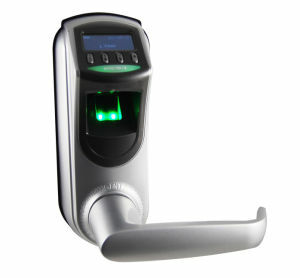 A finger print lock is powered by a battery; you also get an LCD light indicator when you are required to change them. You can easily store 10, 20 or up to 50 fingerprints at one time. One should always keep in mind that the fingerprint is used for verification only, the lock is what provides security. Ask a question: Do you have any question related to Finger print door lock-Bio metric device. Post here, you will get the best answer from best provider.